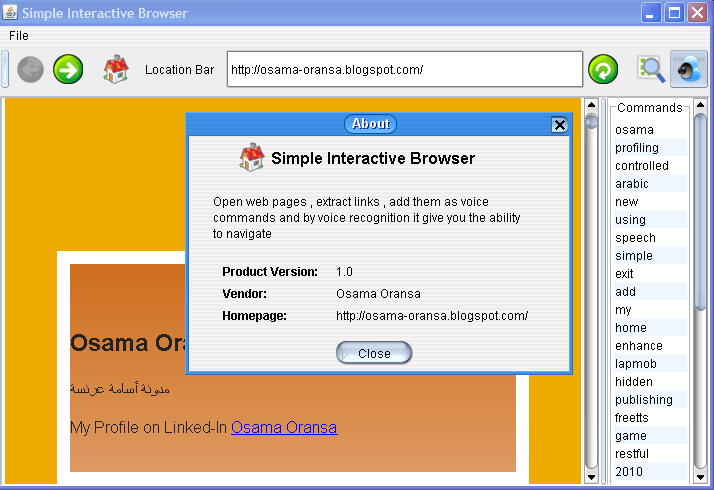 Simple interactive Java browser is basic simple browser show how we can use voice commands to navigate in web sites and use hyperlinks as a voice commands. * Simple interactive Java browser is basic simple browser show how we can use voice commands to navigate in web sites and use hyperlinks as a voice commands. * Uses FreeTTS library for text to speech. * Simple and do not support Java Script. 1) After download the program, extract the zip file and place voice folder in the "C:\"
2) Run the Browser.bat file. In case you are using another operating system or you need to specify another location , download the source code (Netbeans project) and change the path in the source code plus change it in the myconfig.xml file. Use Java Browser Open Libraries to fix the Java Script issue. I was searching for random material on the internet and somehow got pointed towards your blog, and found it very cool, so been following it since then! I was wondering if you could write a tutorial on how to use CMU Sphinx 4 with custom grammar to implement it in your own program.. I am doing a new open source project targeting easy simple interface of what you are asking for , once i got time i will complete it and publish it isA. there is no voice folder in downloaded zip file after xtracting.